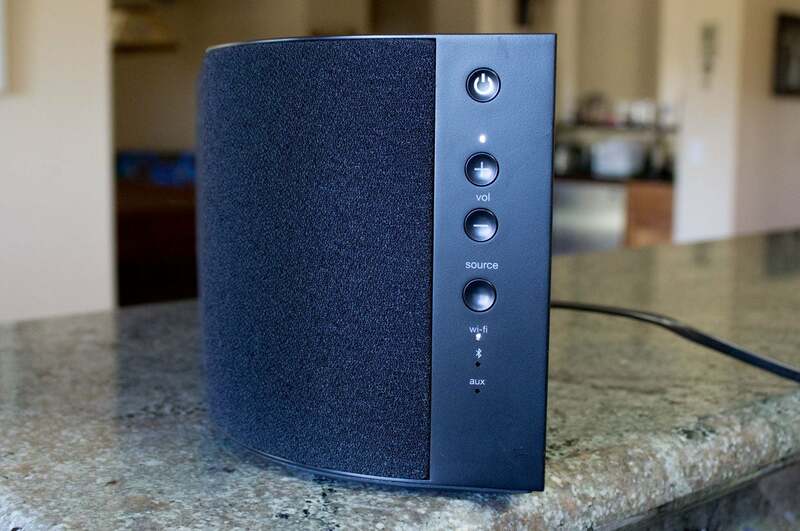 Wireless speaker systems abound, but too many lock you into a single ecosystem. 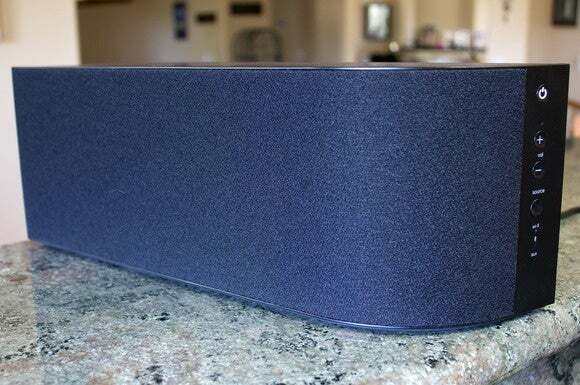 Some support only Bluetooth, others support only Apple’s AirPlay standard, while still others ride the DTS Play-Fi bandwagon. The elegantly crafted Wren V5US bucks that trend by supporting all of those platforms. But that flexibility comes at a price: Due to discounts on Wren’s older speakers, the V5US costs far more than the older speakers that only supported one ecosystem. For example, it costs $250 more than the AirPlay-only Wren V5AP and Bluetooth-only V5PF, and it’s priced $200 more than the Play-Fi-only Wren V5PF. In fact, the Wren V5US’s $500 price tag is $100 higher than the Bowers & Wilkins Zeppelin Air, which is one of the finest sounding wireless speakers I’ve ever auditioned. That’s a tough sell in my book, even if the Wren sounds very good and is some ways more versatile. As I wrote in the intro, the Wren V5US supports all three of the most popular wireless protocols for music streaming: Apple’s AirPlay, DTS’s Play-Fi, and the nearly universal Bluetooth—including aptX support. That means you can stream music from a Mac, iPhone, iPad, or iPod touch using Apple’s AirPlay technology; from a PC or Android smartphone or tablet using DTS’s Play-Fi tech; or from just about anything else that supports Bluetooth 2.1 or higher. 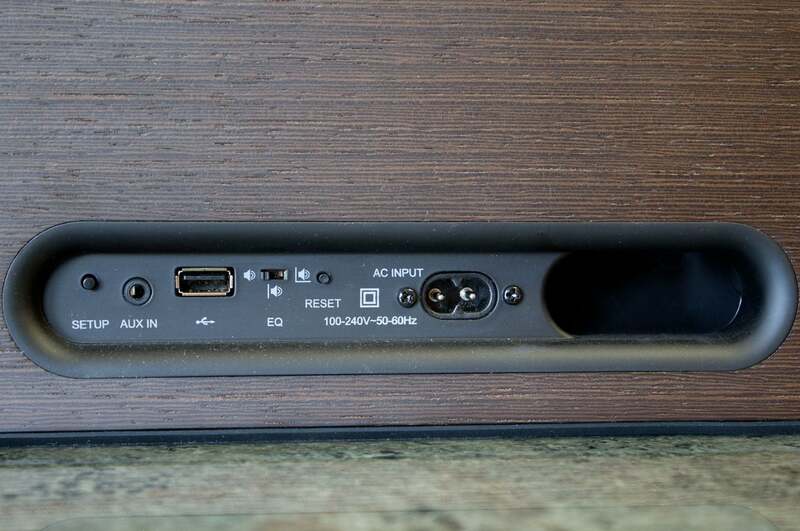 And if none of those connections meet your needs, there’s an analog aux input in the back of the speaker. If you live in a household with a broad mix of devices—like mine—the Wren V5US has you covered. The Wren V5US's primary controls and located on the end of the speaker enclosure. I performed my listening tests using the free Play-Fi app on HTC One M8 smartphone. This enabled me to stream music stored on those devices; tracks in the music library stored on my WD My Cloud Mirror NAS box (using its DLNA media server); and music from Internet radio stations (using vTuner). With a subscription, I could also have streamed tracks from cloud-based streaming service such as Deezer and Songza. Spotify Premium support is coming soon, according to Wren. You can learn more about the Play-Fi system in this story. I also installed the iOS version of the Play-Fi app on a fifth-generation iPod touch and got most of the same functionality, plus support for streaming non-DRM tracks from my iTunes library stored on the iPod. While I was at it, I verified that AirPlay worked to stream tunes from the iPod to the Wren speaker. If you prefer to stream from a computer, Play-Fi software is available for Windows 7 and higher (you’ll need to pony up $15 for the version that enables you to stream to more than one Play-Fi speaker simultaneously, though). I didn’t evaluate the Windows software, and there is no Play-Fi software available for the Mac. The Android version of the Play-Fi app has basic playback controls and a large window for displaying album art. All Wren V5 models can connect to either 2.4- or 5GHz Wi-Fi routers or access points. Their dual 3.0-inch woofers and 0.74-inch soft-dome tweeters are driven by an Intersil D2 Audio DSP-controlled stereo amplifier that outputs 25 watts per channel. The cabinets, fabricated from wood, feel solid and look very attractive. The Wren V5US delivers excellent stereo separation and plenty of bass response considering that its enclosure measures just 16 5/8 inches wide by 6 1/8 inches high. A bass EQ switch on the back of the cabinet offers three settings to compensate for the presence—or lack thereof—of nearby walls. I played the speaker on my kitchen counter most of the time, and left the switch in the position that boosted its bass output. If there’s a wall behind the speaker, a rear vent will bounce air off of it and you can leave the EQ switch in the middle position. Wren recommends using the third EQ setting when the speaker is placed in a corner or near the ceiling to reduce undesirable bass amplification. As I mentioned earlier, the V5US delivers excellent stereo imaging for its size, and its bass performance is respectable but not in your face. The speaker had no problem filling my 17x22-foot kitchen and most of my adjoining 19x17-foot great room with sound. I don’t think it would deliver enough power to drive the beat for a raging party in that space, but it would be good enough for background music to conversation and a game of 8-ball. A bass-EQ switch and a passive vent on the V5US's rear panel helps boost the speaker's low end. This isn’t an audiophile speaker by any stretch, but it delivers instrumentals and vocals with crisp detail and a rich low end, whether you’re listening to acoustic folk music, acid jazz, or hard-core rock. The multi-room features of Play-Fi (and AirPlay, provided you’re using a computer as your controller in that scenario) are attractive, too, but neither Play-Fi nor AirPlay are superior to a Sonos network. And a comparable powered speaker—the Sonos Play:5—is $100 cheaper. The Wren V5US has no equal when it comes to supporting a diverse array of wireless audio-streaming standards, but the price for that versatility is just too dear.